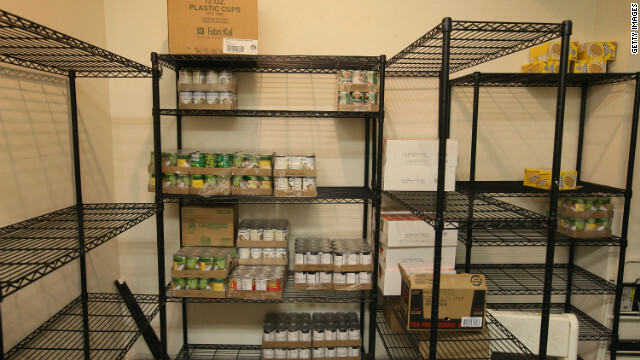 Food Pantries struggle to keep enough food on shelves to feed the needy. Sister Joan Hogan runs the Margaret Aylward Center for the poor in the Los Angeles neighborhood of Pico Rivera. She fought back tears as she explained that there just isn’t enough food to be able to give to everyone who comes to her center for help. According to the U-S-D-A, the number of Americans who are "food insecure" has risen from 36.3 million in 2002, to 50.1 million in 2011. That’s nearly 15-percent of all US households. Barbara Howell, director of the Burbank Temporary Aid Center in Burbank, California says that donations to food banks and food pantries have not risen at the same rate. Howell says they have to prioritize, and the needs of families with small children get served first. The center works hard to provide enough items for their Thanksgiving meal including one of the limited number of Turkeys it has have to give.